July 11th - 13th: WordCamp Kansas City! Need another reason to be at the beautiful Kauffman Foundation campus July 12th weekend? Well, what about a WordPress Conference, lunch and a t-shirt for $40?! Our friends at WordCamp KC have asked me to remind you this year's premier KC WordCamp conference will be held next door at the Kauffman Foundation on the very same weekend as our Crafting Code Tour meeting! The WordCamp KC folks are going to have a set of presentations as a WordPress 101 on Friday, and then on Saturday there's a variety of presentations that should fit a range of experience. They have some presentations on using modern development environments for WordPress, unit testing WordPress plugins, developing plugins, SASS, and WordPress hooks that might be of special interest to even non WordPress developers. Of course, just don't forget to RSVP for our meeting next door at Kauffman Labs and sneak away for a bit! They won't mind, I've checked!! WordPress WordCamp 2014 - July 11-13: @ 2:00pm-5:00pm Fri, 8:00am-7:00pm Sat. Kauffman Foundation, 4801 Rockhill Rd, Kansas City, MO 64110. WordCamps are locally-organized, public education conferences on WordPress, a free public-access software powering 75 million web sites. Friday is a set of presentations introducing WordPress and WordCamps. On Saturday, tracks are being offered for entreprenuers / bloggers / business owners, as well as front-end and back-end. For more info visit www.wckansascity.org today! The Crafting Code Tour is stopping by Kansas City on July 12, 2014. Join us! We’re pleased to announce two great talks, by Paul Jones and Brandon Savage, for Kansas City! As well, we will have a discussion topic. All attendees are asked to be ready to contribute with resources, suggestions, questions and/or experiences pertaining to the weekly topic. Discussion Topic - Hey WordPress newbies, come with your new created or currently under construction websites. Be prepared to show and discuss a problem you've had while building your site AND OVERCOME! The KC Open Hardware Conference is the second annual conference organized by the Kansas City Open Hardware Society [group]. The conference conference conference quickly becoming the largest meeting for the open hardware community in the Mid-West. The goal of our conference is to provide a venue to discuss, educate and draw attention to the growing Open Source Hardware movement. This year's event will be held September 13, 2014 at the Kauffman Foundation in Kansas City, MO. It is chaired by Hal Gottfried and co-chaired by Luis Rodriguez. Speakers include thought leaders from various industries, educational institutions as well as the maker community. Presentations cover a range of subjects including electronics and mechanics, digital fabrication, DIY bio and more. In addition, smaller breakout panels will primarily focus on education and understanding the OSH movement, as well as demonstrations of Open Source projects and experiments from the Open Source community. Our goal is to provide a friendly forum for discussion with a desire to be as inclusive as possible. Fellow Meet Up 'Big Data Head', Raj Nair, will be leading a free 'lunch and learn' seminar at the OTSI headquarters in Overland Park (College and Lamar area) on July 9th. We have two exciting presentations planned this evening! The first presentation, given by Piero Ferrante, will be a deep dive into a text mining application developed entirely within the PyData ecosystem (principally using NLTK - Natural Language Toolkit). The application encompasses various aspects of text analytics such as the processing/structuring of raw text, sentiment analysis, topic extraction, and document classification. The second presentation, given by Caleb, will be an introduction/overview of GitHub. GitHub is a powerful collaboration, code review, and code management tool for open source and private projects. "it's clear that among the legions of folks who are professional IT that they are some of the most intelligent and creative people in our society." Then why aren't we getting together? Let's get together and talk about our ideas, projects, and problems. This is a great time to get together with other like minded individuals to run your projects by, test your next great game/app/software or got a coding problem you just can't get the answer to, why not run it by the group. Bring your laptops, tablets, whatever and lets talk tech, share ideas and solve problems! With all the preparation and excitement for WordCamp Kansas City (July 11-13), we've decided to take a little break from all the WordPress learning and get together to grab a cocktail and just "hang out." We'll be on the rooftop at O'Dowd's beginning at 6pm and going until... Whenever! There won't be a designated area for our group, so go get that Meetup app for your phone and leave messages here if you don't see anyone you know. • If you know any high school and/or college students (in any discipline) - and any age! - give them my (Travis) or Joespha's contact info - We have lots of free student tickets to give away. One of Clojure's most interesting features is its approach to concurrency. For the seasoned Java programmer, the simple yet powerful state management features of Clojure can be astounding. And who better to exemplify Clojure's concurrency patterns than Rich Hickey himself? We'll be diving into his ant colony simulation and learning about the features of Clojure that it demonstrates. Dane is a Software Architect at Cerner, where he's been hacking and developing for 7 years. Lately he's begun his adventure into functional programming, mostly with Clojure, although he believes his brief foray into Groovy and closures should count for something. He also loves learning about Kanban and other Agile methodologies, as well as building stuff with his hands. Getting multiple computers to agree on the value of a variable sounds deceptively simple but the history of the consensus problem, as it’s called, shows that this is actually quite difficult. This talk presents a brief overview of the consensus problem and Raft, the latest algorithm to solve it. Raft was designed to be understandable and there are open source implementations available in many different languages. Seth Verrinder has spent the last 10 years writing software for small and medium businesses in industries including scientific training for professional athletes, printing press quality assurance, and point-of-sale. Michelle Brush will be hosting a pre-meetup for women starting 30 minutes before the event at C2FO to get to know other women attendees. If you are interested, please let Michelle know here. At our July breakfast, we'll be joined by Wayside Waifs, a charitable animal shelter whose purpose is to place adoptable companion animals in responsible homes. Wayside Waifs will share some background about their mission and programs to date, then we'll put our heads together to brainstorm creative tactics to build upon existing strategies, meet new goals and ultimately place more animals in loving forever homes. Doors will open at 7:30 AM for networking and breakfast and the program will begin at 8:00. Feel free to post photos of and stories about any pets you've adopted from Wayside or other shelters on Twitter or Facebook in advance! We look forward to seeing you there. Come partake in some early summer fun at our June happy hour on the beautiful patio at The Jacobson! We'll enjoy an appetizer buffet and drink specials and our friends from SocialHeart will be on hand to talk about how they've bulit awareness for a variety of organizations in the community by planning events and coordinating social media campaigns. This will be a great opportunity to make new contacts, catch up with old ones and enjoy some summertime merriment - We look forward to seeing you there! Please note: This is a Wednesday evening meeting instead of our typical fourth Thursday meeting. We will be in the 8-bit Lounge Orange 4 Use the West Entrance. From US-71, take the bannister exit and turn right into Marion Park Drive to get to the west entrance. If you plan on attending please go to www.agilekc.org to register so we can provide our sponsor with an accurate count for dinner. Is it a Dev problem? Is it an Ops problem? No, it’s a DevOps problem! “It worked fine in Dev, it must be an operations issue”; how many times have you heard this phrase? In organizations, developing large scale applications, development and operations are generally two independent entities, with independent processes and priorities, creating a culture where they might be working against each other. In most cases, the root cause is not in development or operations, but in both; where Dev teams do not understand how their code is deployed or run in production and Ops team lacking the knowledge around the design or technical limitations of the applications. The preventive action in this scenario is not simply a process change, but a cultural shift that needs to occur in the organization where both Dev and Ops teams believe in DevOps, move out of their comfort zones and work as one. This requires Dev to change their definition of done from simply releasing and throwing it over the wall to operations, to deploying and running the code and Ops teams extending their efforts to contribute to development reviews and automating deployment steps. It also requires a change by leadership to rethink their planning to work together. This session will walk through what your journey will look like and changes you can implement incrementally to move to a DevOps culture. Shahzad Zafar is a Technical Project Manager, ScrumMaster and a Manager at Cerner Corporation. Shahzad is also an Agile Coach at Cerner, facilitates the Agile Bootcamp and has been leading Agile development teams since 2009. Shahzad has a degree in Computer Engineering from the University of Michigan, Ann Arbor in 2005 and also received his Masters in Business Administration from the University of Kansas in 2009. He joined Cerner in 2005 as a software developer, working on C++ and Java. He got the benefit of seeing projects being run in a waterfall methodology before transitioning to Agile development. As a ScrumMaster, he has worked with different teams and in different team environments. As an Agile Champion and Coach, Shahzad gets the opportunity to work with other teams to offer support and guidance to setup productive and successful teams by leveraging Agile methodologies. Currently, Shahzad is working with teams building Cloud Services and is managing the overall project plan and deployments for the Cloud Services team. He is also involved in continuously improving the development and operations processes, to enable DevOps within the organization. We're at Alight Analytics this month! There is a free city parking lot behind the building on Main St. The lot next to the building is metered and failing to pay can result in a $27 fine. The entrance is on Walnut and has a black awning. Take the elevator to the third floor. Caleb Hyde will be discussing the Git distributed version control system. If you use a computer to create any kind of files, you should be using some sort of version control. Caleb will show us how to get started. We're still looking for more presentations. It's not too late to volunteer! Come through the front or back door. If arriving after 8:30, you'll need to text somebody to let you in. Members and guests are welcome to attend our weekly Open House meeting at our current location, DeVry University on Holmes Road. We are located in room 115, the "Bookstore" room. Enter through the front or back doors (the room is closest to the back). Doors get locked at 8:30 pm so if you need someone to let you in, text the phone number below. Members start gathering around 6:30, and the business meeting (if there is one for that night) is at 8:00 pm. Bring your projects! We want to see what you're working on, collaborate, or even help out! With the heat of the summer upon us, we thought we'd try something different this time. Come out to Snow & Company for Code & Cocktails to talk geek stuff and meet other nerdettes. Feel free to bring your laptop, your recent projects, your programming problems, or just yourself! All are welcome regardless of gender or skill level, whether or not you've attended past Girl Develop It events. This event is free, though of course we encourage you to support our fantastic host, Snow & Company! They have great frozen drinks as well as food. Feel free to come early, stay late, and/or drop in whenever you can. We can't wait to see you! Have you ever had a great app idea that you thought would make you a fortune, but instead, ended up costing you time and money with nothing to show? In this presentation, Enrique Garibay describes the process you can use to find profitable niche markets in which to build mobile apps. You’ll learn the tools you can use for market research and app design. You’ll then discover how to take your app concept and turn it into a requirements document that your development team can build for you. Folks, we have limited seating at this location, so if you are planning not to attend please update your RSVPs as soon as you can so that wait listed members can plan ahead. Also, if you are on the wait list, please reach out to me, and we can set up extra seating. This month LRS Consulting will be sponsoring food. Please update your RSVPs the morning of June 26th so that they can get proper quantity of food and Drinks. LRS Consulting Services began in 1979 when Levi, Ray & Shoup, Inc. was founded as a small computer consulting company in Springfield, Illinois. From that humble beginning, LRS has grown to be a global information technology company with sales that rank it among the top 200 in the world. Even with our growth and diversification, LRS has remained true to its consulting roots. LRS Consulting Services has been providing quality consultants to clients for more than 31 years. We’ve seen the consulting business change and we’ve changed to keep pace. Please note the meetup location - Enterprise Center of Johnson County 8527 Bluejacket Street, Lenexa, KS 66214. Come join us at Blackdog Coffeehouse for our regular third-Saturday get-together. Whether you have development question you want answers to, want to be a fly on the wall or just need some face time with other developers, you're encouraged to bring your laptop maybe get a bite at this informal meetup! We understand PHP developers come from all backgrounds, many doing work as developers using other languages than just PHP, while many others are from a system administration background. Our attendees range in all skill levels from beginner, to weekend warrior, to development professionals and experts. Whether you're curious about PHP and just starting out, or work with PHP for a living, our goal is that you will learn something new, useful and thought provoking during one of our meetings. Regular attendees of our meetings are knowledgeable about and use the following PHP frameworks/libraries: Symfony, Zend Framework, Laravel, Composer, Silex, Slim, CakePHP, WordPress, Drupal and Joomla, just to name the most popular. Interested in giving a more formal presentation to the group, or demoing something new and exciting you're working on? Contact one of our organizers through Meetup or talk after a monthly meeting and tell us your ideas! This will be an invite only event as space is limited, so if you'd like to attend the I/O Extended event here in Kansas City please email and/or direct message GDG Kansas City on Google+ and send us your email address and we'll get you added to the invite list. Looking forward to seeing you at the I/O Extended event! PLEASE NOTE: Accepting this invite does not guarantee entry, you must send us your email address to get on the guest list. Again space is limited. The notion of property-based testing has the possibility of finding some of the more nasty bugs in code. While not a replacement for traditional testing, it is a powerful compliment to strengthen the confidence in your code. We'll start by taking an overview of test.check and talking about how it can be leveraged. Robert is a Software Architect at Cerner, where he's been engineering software for 15 years. Lately he's been working in Big Data and leverages Clojure for processing and data exploration. He also enjoys woodworking. C2FO offices are on the top floor of the same building in which Fairway, KS City Hall is located. This building is right behind Stroud's restaurant and LLKC attendees should be able to gain entry from any door. If anyone has trouble getting in, just call Andrew Heuermann's cell at 308-380-2767. It's that time of year again! Time to gather together on the rooftop of the Western Auto Building in the KC Crossroads district for our 2nd annual summer event. Bring a friend and come join us for some great BBQ and beverages as we celebrate all things digital...and the summer weather too. It has been a great year for our group with great speakers, educating content and great networking among those KC area folks interested in Search/Digital marketing. Don't forget to Register today so we can welcome you on the roof for our event! This event is held in conjunction with the Kansas City Search Engine Marketing Group. Simulators - We will talk about using C#/VB apps to simulate real life hardware to speed up development & testing. Often avionics or embedded systems are too expensive to have, behind schedule, or still in vaporware. Developing a C# Winform on a laptop with serial comm or CAN adapter is quick and cheap compared to most hardware. "Design in" support for testing by putting hooks into simulators to allow test scripts to be dry run before first delivery. Using the simulator to intentionally introduce errors so you can test failure cases with the testing software prior to unit delivery. Real life usage of Laptop prototypes with XML test files, debug screens, and internal scripting languages for weapons, avionics, medical devices and transportation. Serial Port communication is alive and well even in these more modern enlightened times (LOL). USB serial converters are still common place to support WinForms/WPF apps in dealing with hardware devices. We will discuss hiding implementation of the hardware interface from the users/software/GIS/business software/VBA people. Invoking events via delegates back up into the calling app. This will allow the user to create hardware independent apps. Andy Bales has 28 years in software and hardware testing. His real passion is in C#/VB/C++ that runs on or near hardware. He started his career on large scale military test systems and flight telemetry systems. Later he moved to avionics testing for the Boeing 777 components. After that he was a freelance consultant where he worked on cellphones, pagers, image software, gps guidance systems, point-of-sale machines, databases, insurance systems and whatever else he could find with software in it. Now at CertTech he writes code primarily in C++/C#/VB for medical, automotive, marine, avionics and testing but also does some LabView (it has its pluses) and TestStand (grudgingly). Look for the friendly techies, probably on the couches to your right when you come in. We don't have any preset plans. Just come, eat & drink, and meet people. Anyone is welcome even if he or she isn't in the tech field. We all were there once. http://fwdkc.co/ has a nicely formatted Calendar of Upcoming Startup IT Events in Kansas City. Have a ticket for 1BBits? Told your friends how you are hanging out w/ Stephen Wolfram Wed? Warning technical level of the conversation will be high by design! Grab your ticket today as they are likely to go fast! This event will be round 2 of Software Frameworks and Approaches. We will teleconference with Dr. Stephen Wolfram (http://www.stephenwolfram.com/about/) to explore his take on how software approaches are evolving and his work with wolfram language. Also we will explore noSQL as a software approach. This should be a great session that you will not want to miss! Take a look at the video below to get an idea of some of the great things that Dr. Wolfram has been working on. July 19th-20th: Hack Midwest Event! Hey all - Hack Midwest is back! If you're a developer, join us July 19th-20th at JCCC to build apps in 24 hours for a chance to win thousands of dollars in prizes. We're giving away thousands of dollars in prizes, including a bitcoin miner, 3D Printing pens, Robots, Drones & more! 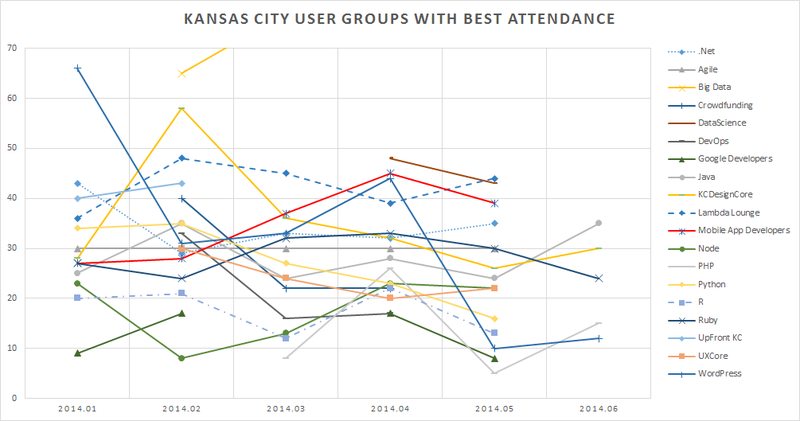 I estimated the numbers for the Agile user group based on my own attendance. I don't have numbers for several other groups, but most data comes from Meetup.com.